Fall has arrived on our front stoop! All of the pumpkins, except for the grapevine one that lights up, were purchased at Michaels. The one with lights was bought at Pier 1 last year. They're all piled up on our thrift store wooden crates, which are coming in handy. 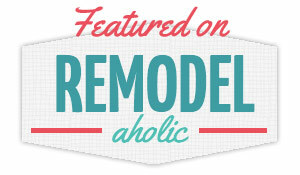 We're also using them in the recently-revamped guest room. Those limbs are from our firewood pile, which is HUGE now that we chopped up that giant tree limb that fell on the house back in June. That monogrammed pumpkin was pretty simple. It's a craftable white pumpkin from Michael's that I painted with acrylic craft paint. It looked a little flat with just the black monogram, so I added the gold stripes. I love how it plays up the other gold and metallics with my pumpkin collection! The polka dot pumpkin is another white craft pumpkin that was painted with gold spots from a circular sponge brush. I basically stamped them on, and it was super simple. The swirly pumpkin is an orange foam pumpkin that I decorated with puff paint. Once I had the swirls done, it still looked too "crafty." I took my gold craft paint and painted a thin layer over the whole thing. The orange still shines through, but this gives it a little shimmer that makes it look more complete. I love how it looks at dusk! Scott said the new decorations make him excited for fall. Truth be told, we're not really feeling the autumn weather down here in Dallas– it's still in the 90s this week. These front door decorations are sort of wishful thinking on my part, but a girl can dream! I'm looking on the bright side– at least we aren't melting into sweat puddles like we were a month ago! 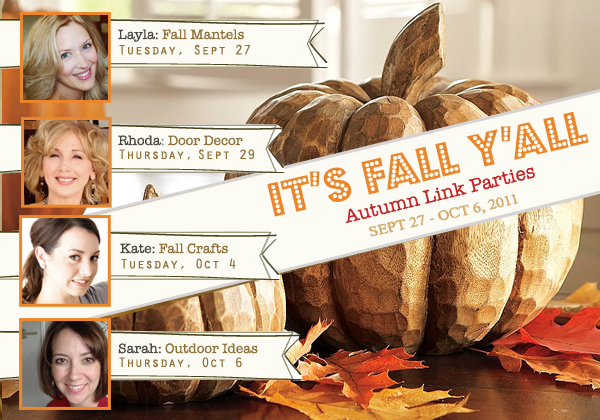 I'm linking up to Rhoda's Fall Linky party!